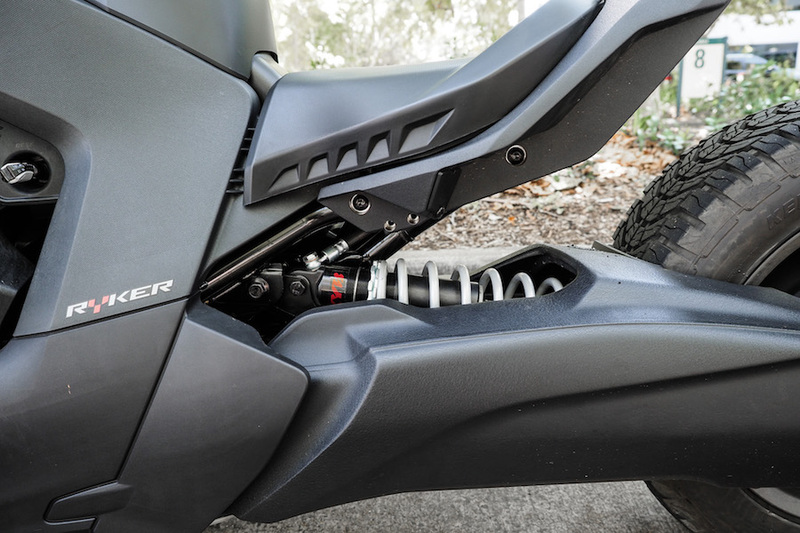 If you’re looking to get on a motorcycle, then Can-Am’s new Ryker won’t be for you. But if you are looking for the freedom that motorcycling offers and the individuality that invariably comes with it, then the new Ryker could be right up your alley. Its non-leaning, three-wheel set-up means it offers the stability similar to a car, but still lets you feel the wind in your face like a bike would. And, thanks to one of three variants being powered by a parallel-twin cylinder 600cc engine, you can do it all on a learner’s permit, too, which is a first for the Canadian brand. 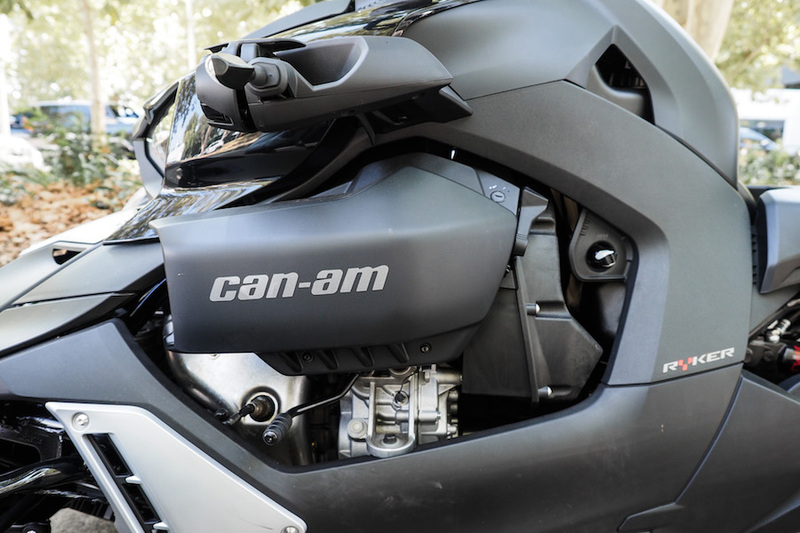 Can-Am has been manufacturing its three-wheeled Spyder range since 2007, and even though Ryker looks very much like a Spyder, they share only a handful of components. 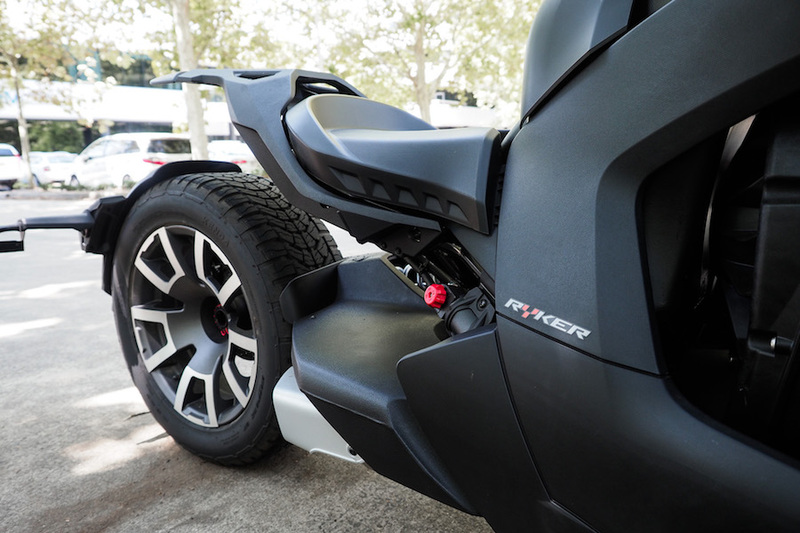 The Ryker is both longer and wider than the Spyder and it employs a automatic CVT transmission compared to the Spyder range’s manual/semi-automatic gearbox. 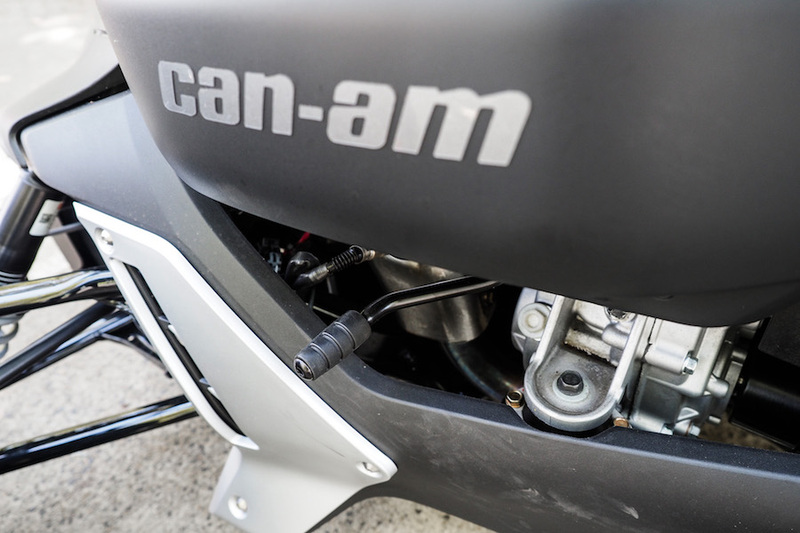 As well as the 270kg (dry) LAMS-approved version which is capable of 37.5kW and almost 50Nm of all-important torque, the new-for-2019 Can-Am Ryker will also be offered in two 900cc triple-cylinder variants, a standard model and a Rally Edition. 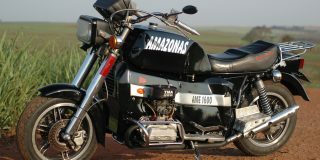 Both are powered by the same 61kW/79Nm engine, the standard version weighs 10kg more than the LAMS version at 280kg (dry) while the Rally Edition gets reinforced wheels better suited to gravel roads, grille protection, a bash plate and hand guards, all of which adds five kilos to the overall weight. There’s different electronics, too, but more on that later. The 600cc Ryker is priced at $14,899 (plus on-road costs), which is a whopping $12,791 less than the cheapest Spyder and a clear and strategic move by Can-Am to attract would be owners into the three-wheeled fray. The 900 is $17,299 (+orc), and the Rally $18,299 (+orc), all considerably cheaper than their cousins. 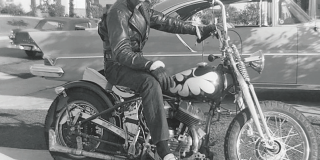 Sitting on the Ryker and firing it into life is a familiar affair for a motorcycle rider, but that’s where it stops. 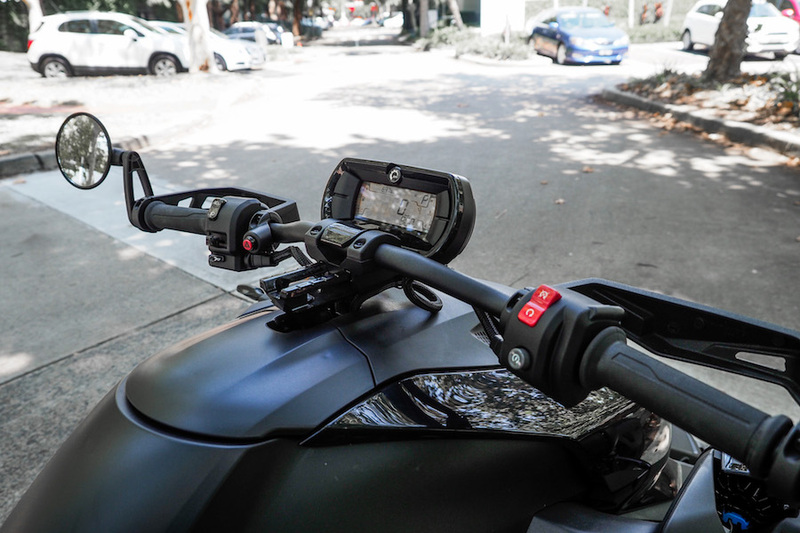 But fact that riding the Ryker feels nothing like riding a motorcycle probably won’t be a concern for the LAMS machine’s target market as they won’t need to un-learn the the important stuff required to ride a two-wheeler. But those who do possess even the most basic amount of riding ability will find the Ryker a bit odd at first. Even though I’m still on my restricted licence, I’ve been riding two wheeled things my entire life, so my brain grappled with the concept. 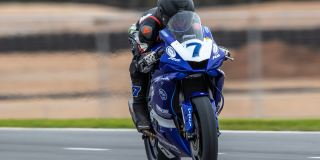 Compared to a motorcycle, you pretty much need to do the opposite; you still put your body weight towards the inside of the corner, but because gyroscopes aren’t in play here to determine your steering you pull left to go left and, well, it takes some getting used to. So does the fact that there are no bar-mounted levers. The CVT negates the need for a clutch lever and the linked braking system is controlled by a single foot pedal on the right. And for someone who’s been riding their whole life, you’d be surprised how mind-boggling it is to only have one single lever to operate. My left foot was constantly twitching, and my right hand kept reaching for the non-existent clutch lever every time I slowed to a stop. Though for me, the brake pedal wasn’t placed in a intuitive place to manipulate and I found my foot resting on the brake which upset the balance, especially through corners. 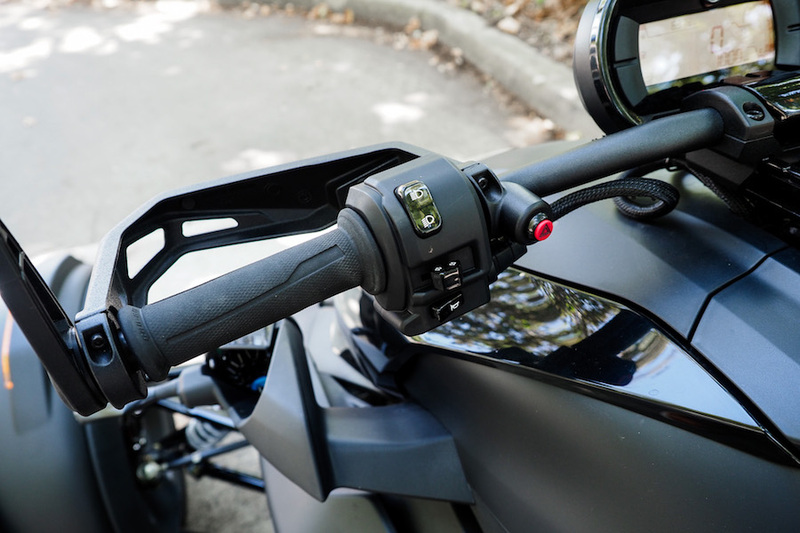 Despite its three-wheeled stability, there’s plenty of electronic rider aids which work to ensure the thing stays glued to the road in the direction you point it with no chance of the rear end sliding out as you rip open the throttle on corner exit. 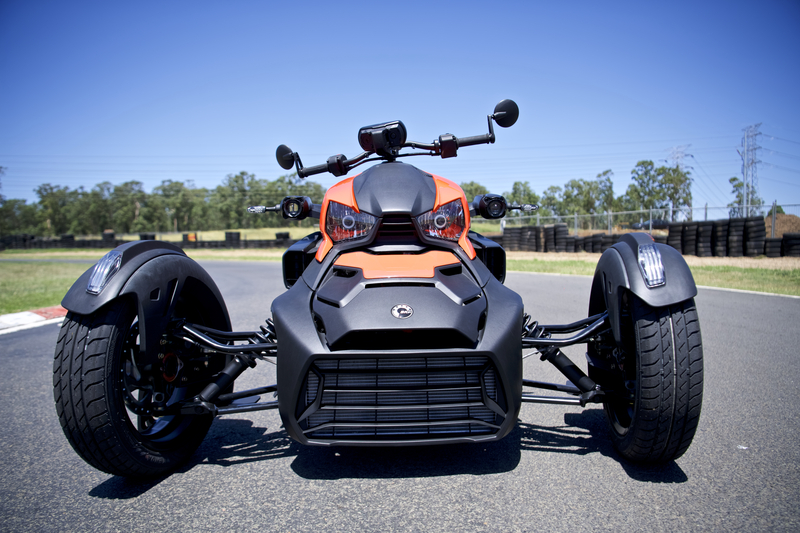 But that’s not to say the Ryker doesn’t have a little bit of hoon lurking within its soul. Both the 600cc and the 900cc versions will spin the rear wheel if you snap open the throttle from a standing start. Considering both machine’s largely differing capabilities, they both deliver their power in impressively linear ways. 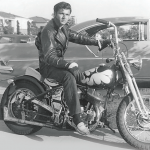 The Ryker is much more than a LAMS-approved Spyder. The Spyder has always been viewed as a three-wheeled performance-orientated machine, whereas the Ryker is less about performance and more about fun and practicality. Sachs looks after the suspension in the form of a double wishbone front-end actuated by a couple of twin-tube shocks, a third one is employed at the rear and which is adjustable only for preload. 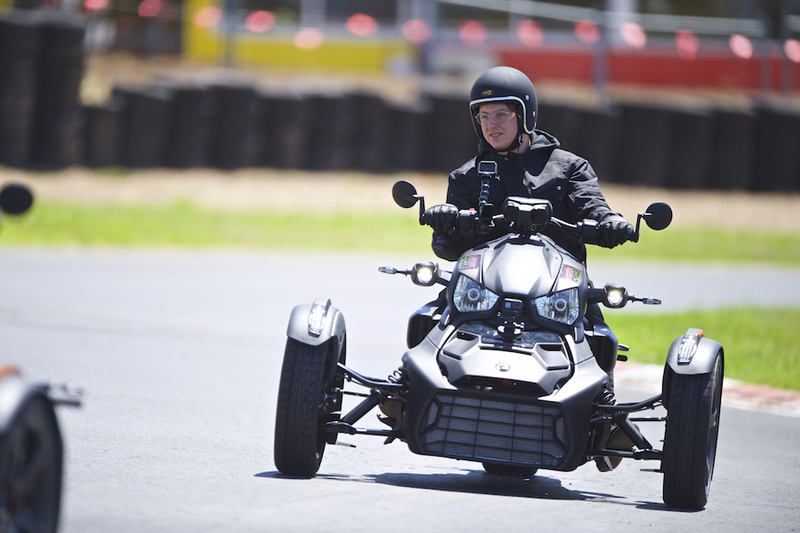 basic on paper, it’s more fun sports than fun touring and handled a romp around Sydney Motorsport Park’s go-kart track with ease. 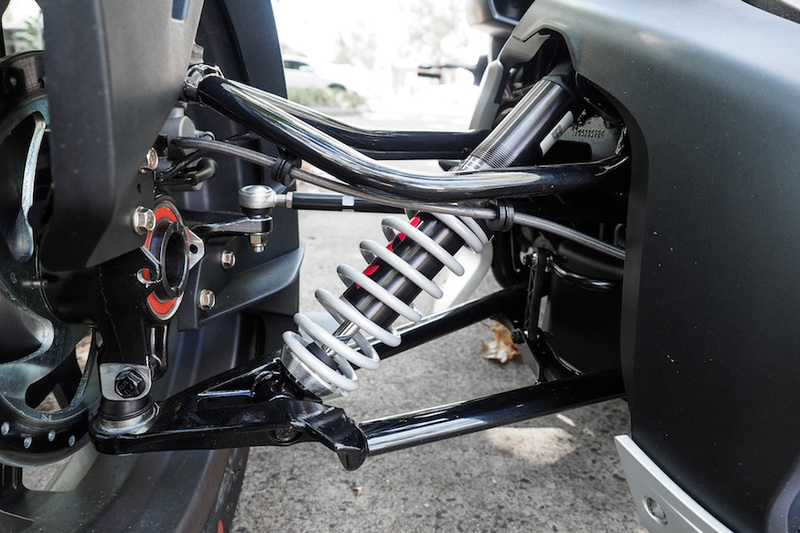 If you’re looking for more spec, the Rally Edition will feature KYB suspension all round wit the front pair adjustable for preload as well as a fully adjustable rear shock. The thing remained stable, even when smacking up and and off the ripple strips, but I found the traction and stability control systems a little to eager to cut in and spoil the fun. 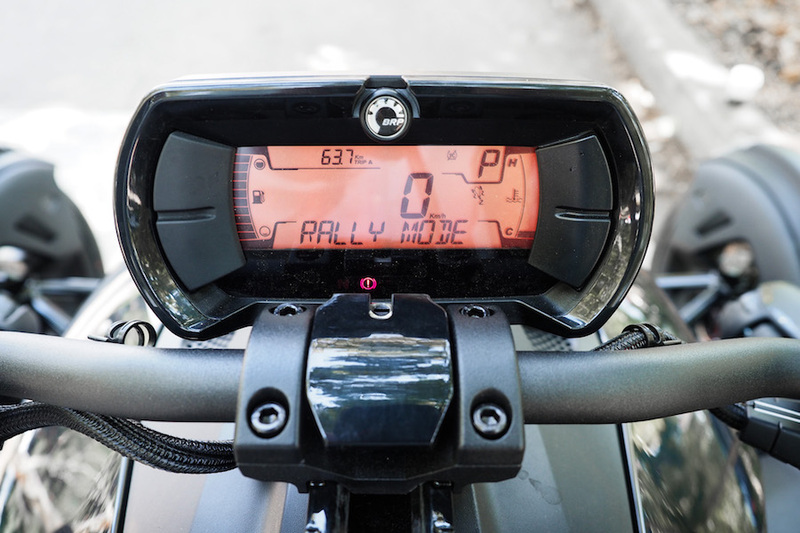 It would be a truly fun machine if it allowed the rear end to slide a little – especially because there are so many lateral forces at play here – it’s physically draining at speed around a tight circuit. The electronic intervention stops at wheel lift though, as I found out a few ties when the inside wheel lifted off the ground through the tightest of corners. This, combined with unintuitive nature of the thing, made it hard from me to really give the Ryker all of my trust, but I’d imagine trust is something you’d learn pretty quickly as the it became more and more familiar through ownership. It’s difficult to critique a machine that’s so far removed from else I have ridden or driven. I guess the only think I felt lacking was can-Am’s decision to opt for a CVT transmission instead of a far more engaging manual unit. The transmission itself is as good as it gets in its execution, but I can’t help but think the concept would be more successful if would-be owners were given the choice between a manual or CVT ’box. 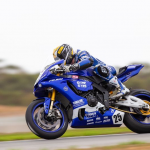 The manual transmission is all but gone from the automotive industry and I can’t help but feel it’s now under attack in the motorcycle industry. 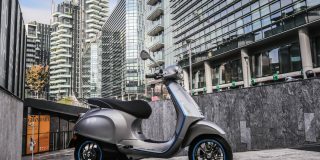 The 600cc version comes equipped with a single riding mode and as a result means the traction and stability control systems remain constant. 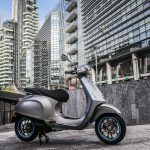 The standard 900cc version boasts a two switchable maps, Eco or Sport, with the latter reducing both both the traction and stability control systems’ intervention. The Rally gets a third, er, Rally mode, which lets the rear end get a bit loose in appropriate situations. I left Sydney Motorsport Park’s go-kart track far more impressed than I thought I would at the start of the day. But it still left me wondering who exactly will be prepared to hand over $15K for a LAMS-approved three wheeler. Is the teenager who just jumped through all of the two-wheeled licensing hoops going to opt for a wild-looking three wheeler? It’s hard to say. 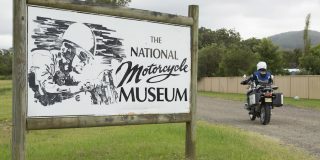 I reckon it’s really well suited to returning riders looking to feel the wind in their hair again without the fear of dropping their bike, or the older rider who sees the Ryker as a really accessible and safe way to tick that ‘motorcycle licence’ off the Bucket List once and for all. Either way, it’s a seriously unique weekender or, if you let it, a practical daily to have in your shed. 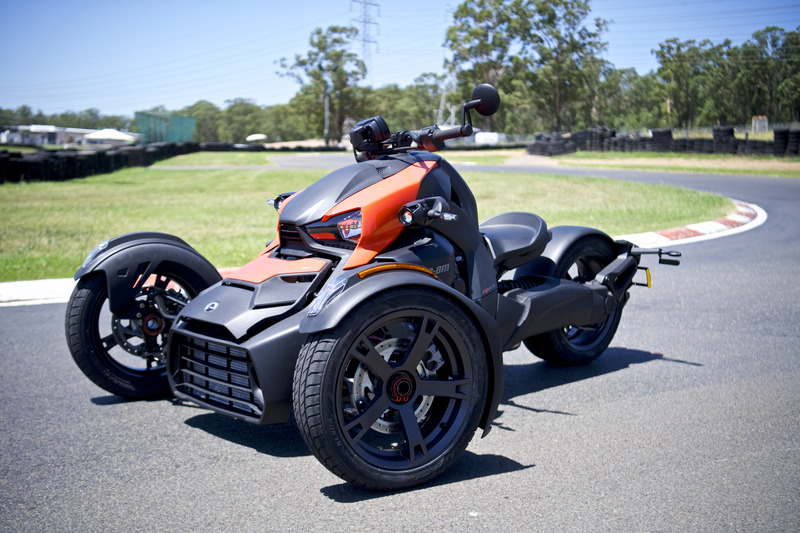 And if Can-Am can convince the regulators that a seperate three-wheeled licensing system is a good idea (see breakout), then we might start to see a few more on Aussie roads. 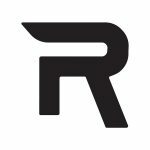 As well as different-coloured interchangeable panels which allow you to easily tailor your ride to your individual mood (or outfit), all versions of the Ryker also makes use of the firm’s so-called Ufit system which let’s the rider customise the machine’s ergonomics. 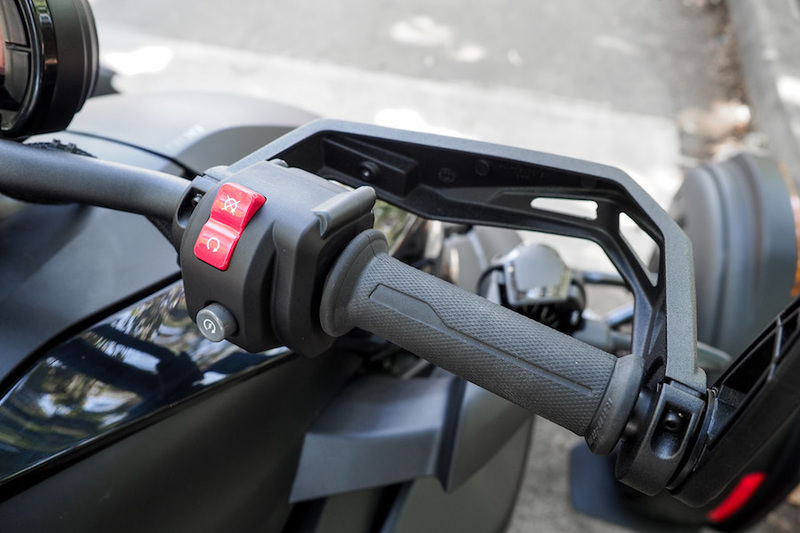 It’s been done so well in the automotive industry for decades, the tool-free system lets you jump on and adjust both the handlebar and footpeg position quickly and easily to increase comfort and reduce fatigue. 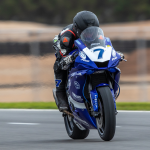 As a restricted licence holder, and with the pre-learners and provisional license tests still very fresh in mind, I couldn’t help but wonder how a new rider would successfully negotiate a 1509mm machine through the cone-dappled testing course all new riders are required to do. While you wouldn’t lose any points for putting a foot down, the rest would be virtually impossible. 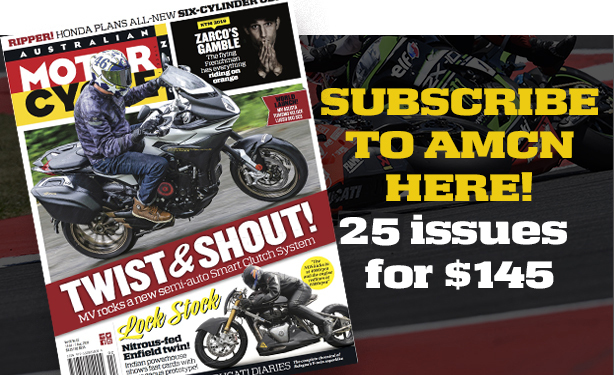 And if you’ve been made to gain your licence on a two-wheeled machine, then there’s a good chance you might just stick with it and dismiss the idea of a Ryker altogether. 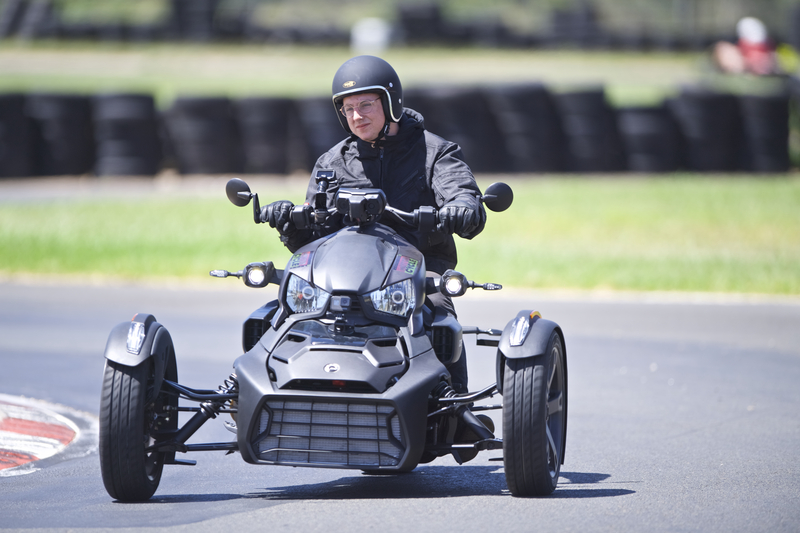 Which is exactly why Can-Am’s parent brand BRP is currently lobbying for a licensing system specific to three wheelers, in the same way a personal watercraft licence is seperate to a standard boat licence. And for the LAMS-approved concept to really get any meaningful traction in a market like Australia, it’s going to have to lobby hard and make it happen.